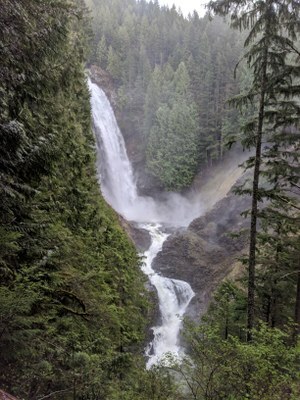 A wonderful rainy hike to all three Wallace Falls. The trail is well marked and in good condition. The trail has a lot of rocks and roots though nothing that would cause too much trouble. Everything was wet and the roots were slippery along with there being a fair number of muddy spots on the trail. Driving to Wallace Falls as well as parking weren't much of an issue based on how early we arrived. When we finished the hike, the parking lot was completely packed. I'm sure someone appreciated are empty spots. It was raining during the entire hike. Everyone had rain gear though that didn't prove to be perfect since some of us still ended up a bit wet by the time the hike finished. We still had a good time despite this. The route we took could be broken into two pieces: a direct path on the way out to Upper Wallace Falls and a detour via the railroad grade trail on the way back. The route to Upper Wallace Falls included stops to both the Lower and Middle Falls. All three were experiencing a heavy flow and made for scenic stops. The rain did prevent us from taking advantage of some of the viewpoints since it was too cloudy to see the valley. This will just have to be an excuse to visit the area again.